This will be a two part article regarding Swedish King Gustavus Adolphus the 2nd. 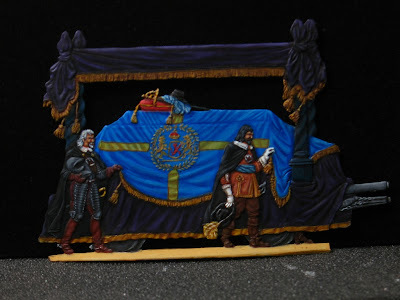 The set is depiciting the funeral of the Swedish King after his death at the Battle of Ludzen. In the first part some historic notes along with a general guide of the painting is presented. Twenty three out of a total of forty three figures are ready and presented here. 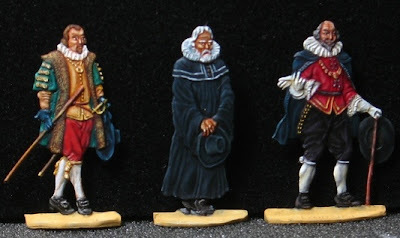 The rest twenty figures, along with some specific information on painting, will be the topic of the second part, and will presented as soon as the figures are ready. Gustav II Adolf (also known as Gustaf Adolf the Great). 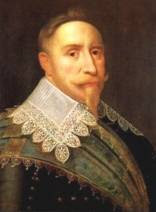 Swedish Gustavus II Adolphus; December 9, 1594 – November 6. 1632), widely known by the Latinized name Gustavus Adolphus and referred to by contemporary Protestants as the Lion of the North, was King of Sweden from 1611 until his death. He is the only Swedish king to be styled "the Great". He was born in Stockholm, the son of Charles IX of the Vasa dynasty and Christina of Holstein-Gottorp. He was King of Sweden from 1611, and as such, he was one of the major participants in the Thirty Years' War. Gustav Adolf was married to the daughter of the elector of Brandenburg-Prussia, Maria Eleonora, and chose the Prussian city of Elbing as the base for his operations in Germany. He died in battle on November 6, 1632 at Lützen in Germany. During his reign, Gustav Adolf founded the city of Gothenburg as well as a number of smaller cities. He is also the founder of the University of Tartu in Tartu, Estonia, which then belonged to the Kingdom of Sweden. At this time, the three largest cities in the Swedish kingdom were Riga (the capital of Latvia), Stockholm and Tallinn (capital of Estonia). Gustavus Adolphus organized the strongest army of the early seventeenth century, courageously led his forces from the front, and earned the title of the "Father of Modern Warfare" because of his innovative skills in the tactical integration of infantry, cavalry, artillery, and logistics. His advancements in military science made Sweden the dominant Baltic power for the next one hundred years. Future commanders who studied and admired Gustavus included Napoleon I. As a general, Gustav Adolf is famous for employing mobile artillery on the battlefield, as well as very aggressive tactics, where attack was stressed over defense and mobility emphasized over the usual linear tactics. His musketeers were widely known for their shooting accuracy and reload speed, three times faster than any contemporary rivals. Carl von Clausewitz and Napoleon Bonaparte considered him one of the greatest generals of all time. He was famed for consistency of purpose, and amity with his troops. The king was an active participant in his battles. He was prone to lead charges himself at crucial moments, and was wounded several times as a result, including gunshot wounds to the neck, throat and the abdomen. Because a musketball was lodged in his neck near the spine and would cause extreme pain if he wore the customary two-part metal shell cuirass, the king adopted a flexible armor of hide. This is what he wore in his final battle. His leather armor is currently on display in the Livrustkammaren at the Royal Palace in Stockholm. Gustav Adolf occasionally used the name Captain Gars, especially early in his reign, to travel incognito. Gars is derived from the initials of "Gustavus Adolphus Rex Sueciae", Latin for "Gustav Adolf King of Sweden". He was a highly enlightened ruler, and held the Swedish nobility on a firm leash, supporting both the merchant and worker class against the nobility. 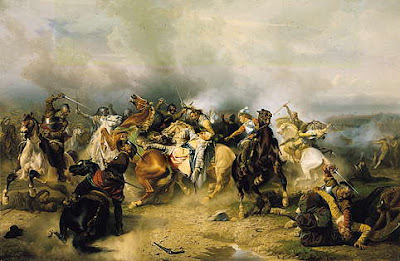 Gustav Adolf was killed at the Battle of Lützen, when, at a crucial point in the battle, he became separated from his troops while leading a cavalry charge into a dense smog of mist and gunpowder smoke. After his death, his wife initially kept his body, and later his heart, in her castle for over a year. His remains (including his heart) now rest in Riddarholmskyrkan in Stockholm. Before Gustavus, groups of uncoordinated mercenaries composed most armies, with little overall organization or chain of command. The Lion of the North (as he was known) instituted permanent units, assigned a fixed chain of command, and established a philosophy of cooperation among all combatants. Instead of independent action by many different parts, the entire Swedish army now united to fight as a single team. 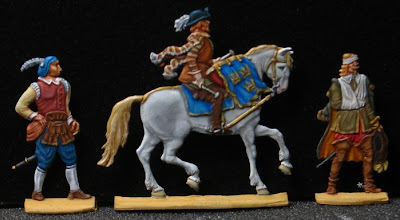 Gustavus's use of supply lines and bases and his integration of infantry, cavalry, and artillery enabled him to form the first truly professional army in military history. The crown of Sweden was inherited in the Vasa family, and from Charles IX's time excluded those Vasa princes who had been traitors or descended from deposed monarchs. Gustav Adolf's younger brother had died years ago, and therefore there were only female heirs left. Maria Eleonora and the king's ministers took over the government on behalf of Gustav Adolf's underage daughter Christina of Sweden on her father's death. He left one other known child, his illegitimate son Gustav, Count of Vasaborg. The Funeral of Gustavus II Adolphus by Mohr is a classic Wimor set consisting of 43 single or group figures of magnificent detail. They are so well engraved that one has to consider if these small jewels would be better unpainted. They required only some minutes each for clean up and priming to get them ready for painting. Which was a good think for me because I couldn’t wait to start painting them. 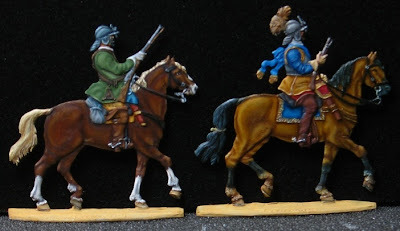 Each figure received 2 coats of thinned white humbrol paint and set aside for a couple of days to dry totally. 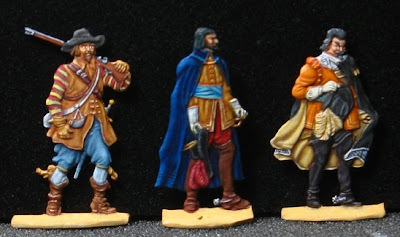 What is important when you painting a set of figures that will be grouped together is first to keep the light source direction constant. I chose a rather common approach of upper left illumination, which it was rather difficult as I found out later because all the figures are presented by their right side and faces are faced to the left. That means that most of the faces are in shadow. What I did for this situation was simply to produce a bit darker mixtures in all flesh tones and create some deep shadows where appropriate, while keeping highlights on the softer side... I tried to highlight upper left sides of all figure a bit more than the lower left sides. 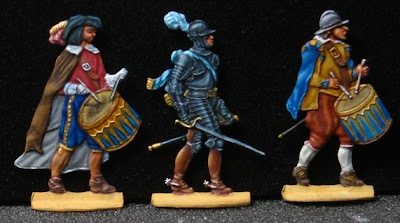 Maybe if I should have thought better I would choose an upper right approach for convenience since painting 43 figures isn’t something easy by itself. 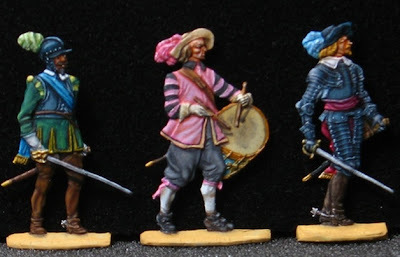 Next important thing you have to consider is that since there are many figures with various hues and tones, it would be better if you paint them in small groups of neighboring figures. That simply means that for each 3-4 figures that are close with each other, tones must be kept in harmony so a better aesthetic result will be produced when they are finished and displayed. Hues that “suit” each other such as yellow and brown, or red and green were used for this purpose with shadows mainly produced by their complementary colors respectively. Another small trick which I strongly advise when doing such a big set is to keep color mixes simple. Every piece of flesh, every cloth they wear, every item they carry, is painted by an individual mix. No two reds are identical, not two blacks are of the same mixture or not two whites are of the same color temperature. Instead, I started from scratch for every color I used for all figures. While you vary your colors, keep the color mixes simple. I personally never use a color that is produced from more than 3 or 4 different hues maximum. If you keep adding colors, end result will be either a mud pool or the actual color will have lost its chroma or temperature somewhere in the process. 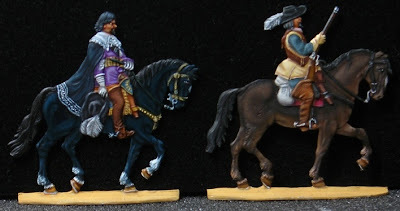 I chose to display them in a left to right facing direction with Adolph’s funeral cart and its horses as a central piece and all other figures surround it symmetrically as I though it would produce a nice aesthetic result when they will be finished. I will use black velvet background and after putting each figure on it, measuring distances between lines, rows and individual figures, I will give the whole canvas with figures to a specialist for making the frame. I will chose a simple frame so as not to out power the subject since it is most complex by itself. Name tag will also come from a specialist engraving shop. 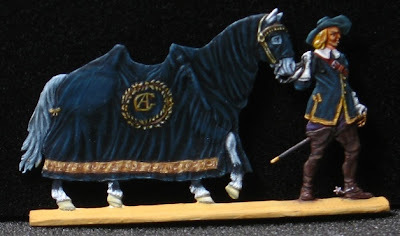 Mohr’s set of “The Funeral of Gustavus II Adolphus” is one of the best set of figures I have ever came upon. Attention to detail is stunning even for the tiniest parts. Although is not an easy task to paint all these figures, surely the end result, when they are finished eventually, is most satisfying. I would recommend this set to any collector of flats, especially of this period, but not for beginner painters. Not only the great number of figures, but the small details that most of them have, make it a rather challenging task. Slow and careful painting, good references and lots and lots of time spent and coffee drunk is all that is needed. 1. King's Life Guard Rgt, Timbalier. 3. King's Life Guard Rgt, Timbalier. 1. Duke Bernhard of Sachsen (Second-in-comannd). 2. Germa Life Rgt Usslar, Arquebusier. 3. Major General Dodo von Innhausen (Third-in-command). 2. King's Life Guard Rgt, Timbalier. 1. Streiff, the King's horse. 1 & 2. Horses of the King's cart carrying casket. 1. The King's casket draped with Swedish flag, escorted by Swedish officers. I've ever liked things like sand clocks, lava lamps, and the like to type of just fritter away space staring at it as a cut of catharsis. In a way, it helps me with meditation, to reduce stress and strain and decent think fro nothing. That's why since I was a kid, instead of dolls and cars I've always collected more of such pieces like sand clocks, lava lamps, musical boxes etc. So I was most enchanted when I establish the[url=http://www.dealtoworld.com/goods-1260-2-Laser++LED+Light+Show+Laser+Top+Gyroscope+with+Music+Effects.html] 2-Laser + LED Inconsiderable Manifest Laser Crown Gyroscope with Music Effects[/url] from DealtoWorld.com under the aegis the Toys section. It's like a tuneful box, a spinning exceed, and a moonlight divulge all rolled into one. Which is prodigious amusement! The gyroscope transfer outing for about a minute. The laser slight pretension with accompanying music makes this gyroscope a pretty corresponding exactly toy that my friends have also been most amused with. My dogs are also pretty curious nearly the laser gyroscope I got from DealtoWorld.com. They evermore follow the gyroscope as it spins, although at first they kept barking at the laser insight boast, and also because it produces music. But after they got employed it, they've stopped barking but simply keep following the gyroscope whenever I start spinning it. Kids are also unbelievably amused by it. Occasionally it's good to maintain fun toys on all sides the blood so that you can desert the diminutive on while the kids are being amused or playing with it while you count fit out foodstuffs or get changed. The gyroscope is inseparable such toy with this purpose. The gyroscope I bought from DealtoWorld.com has a dragon as a map on it, and produces a gegenschein indicate with red, downcast, and common colours. Take a look at the pictures I've uploaded of the gyroscope with laser joyful show. The music produced from the gyroscope is not that great but good enough to accommodate any new visitor to the house. The gyroscope is red and raven, making it look particular cool, and measure masculine with that dragon imprint. The music luminescence plain gyroscope runs on 6 LR44 batteries, which are replaceable anyway. I've also utilized this gyroscope to their heels my girlfriend during our anniversary celebration. I did the cheesy chore of decorating the pension latitude with roses and when I led her in, I started up the gyroscope as affectionately so that the laser light expose produces a dreamed-up effect. I also had some battery operated candles so all the understanding effects created a degree dreamt-up atmosphere. She loved it, not later than the style, to my relief. I also bought the candles from DealtoWorld.com. These days it seems to be my non-performance shopping locality in return all gifts and ideas for fancied occasions. Since Christmas is coming, this laser light playing gyroscope can possibly be a momentous Christmas contribution looking for the toddler or methodical the humour! Alternatively, the gyroscope can really be a gracious totalling to the established Christmas decorations. I can presume placing it adjoining the Christmas tree and perchance spinning it when guests reach in the house. Looks like [url=http://www.dealtoworld.com]DealtoWorld.com[/url] is getting my business anyway again!